Fall is a time of change. The leaves change color, the weather changes from warm to cool, and we change our clocks to fall back an hour. This last change means that many of us will get home from work in pitch-black darkness; for me, the early onset of night makes me less interested in cooking dinner and more interested in getting in my sweats, throwing leftovers in the microwave, and binge-watching The Affair. But even the laziest among us can put together a soup and/or salad for dinner. What's more, it doesn't take much extra effort to kick these weekday favorites up a notch. 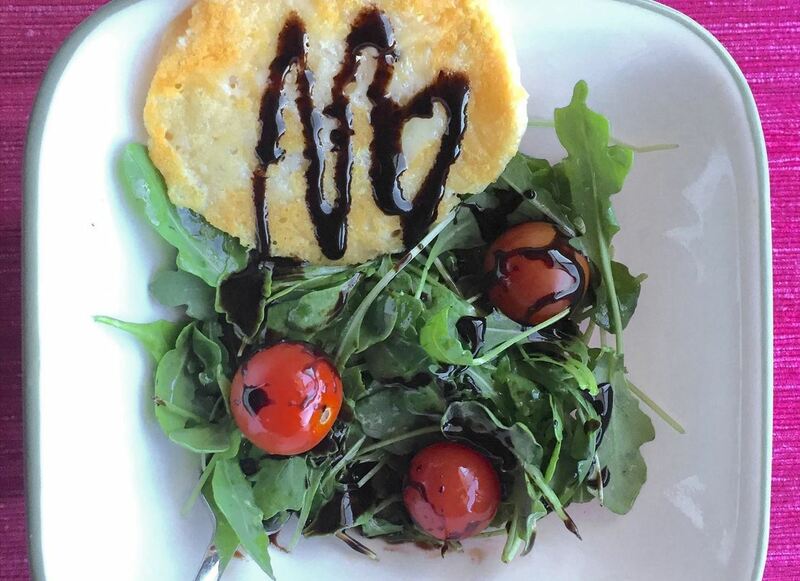 Just use croutons. 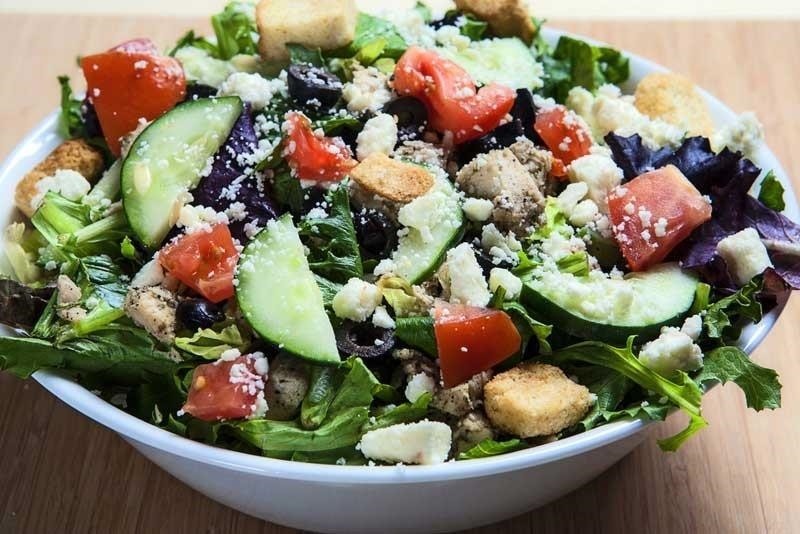 However, using the same type of croutons gets old fast, so here are some creative substitutions for croutons that you can put in your soup and on your salad to give your simple dinner a little interest and zing. 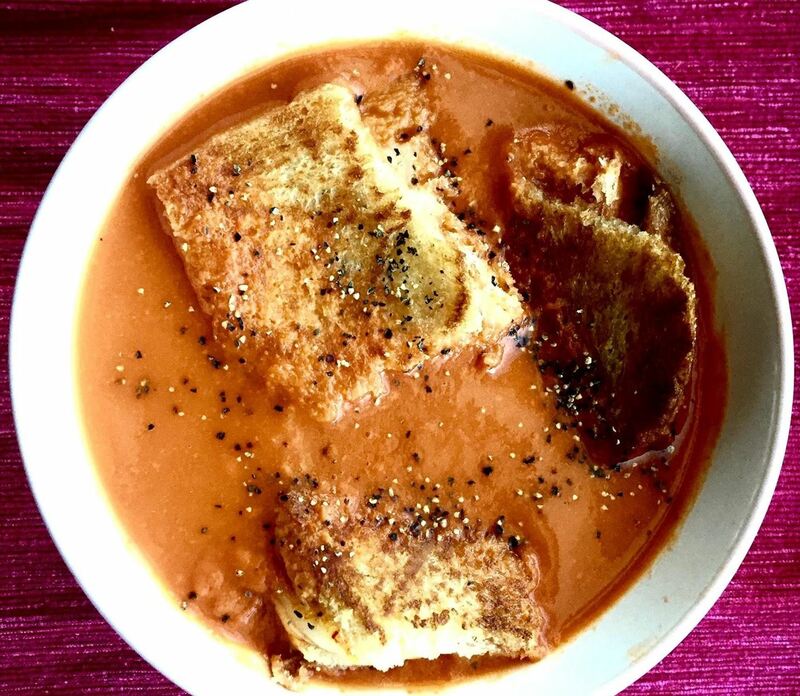 That's right: in the soup, not next to it on a plate—which means fewer dishes to wash. Just make grilled cheese the way you normally do (I'm a big fan of sourdough bread and Muenster cheese), then cut the gooey delight into tiny squares and place them atop creamy tomato soup. One-bowl comfort food for the win! 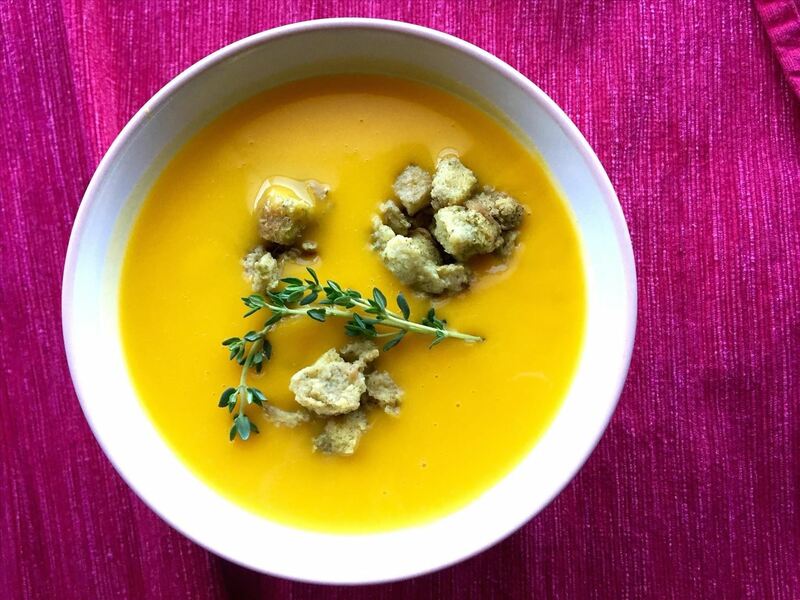 This creamy pumpkin soup makes use of two parts of the pumpkin—the seeds and the flesh. 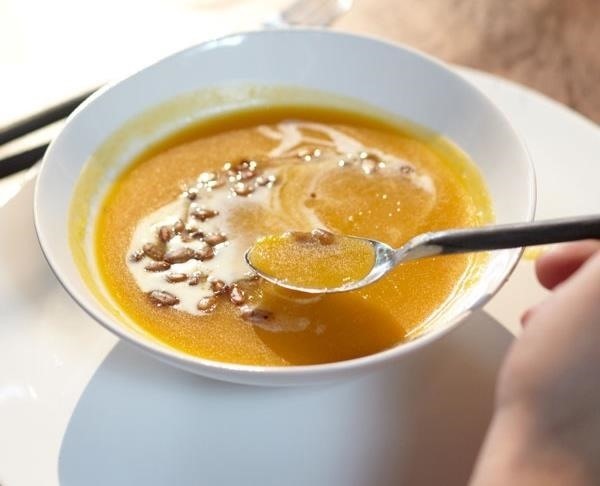 The spicy-sweet pepitas, or pumpkin seeds, are a perfect complement to the luxurious soup; make some extra for tasty fall snacking. Cintia of the Aussie blog My Poppet waxes poetic about the beautiful salad that she enjoyed at the Museum Harvest Café at the Yarra Ranges Regional Museum in Lilydale. 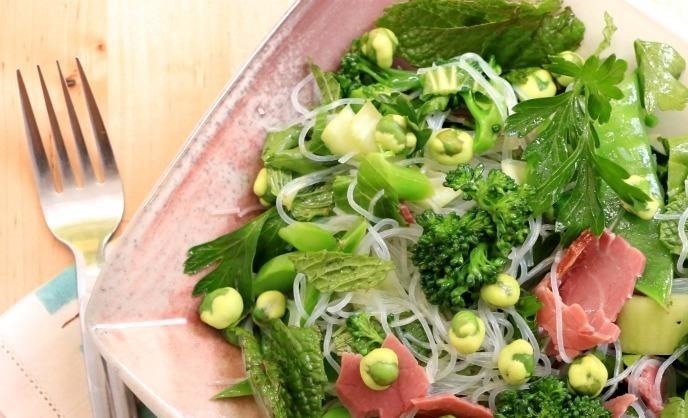 Her version, green salad with beef and wasabi peas, takes only 15 short minutes to make and is packed with a variety of flavors and textures. Thanksgiving is right around the corner! At my holiday table, stuffing is heartily devoured and not much is left in the way of leftovers. This is a nifty way to make use of a quantity not great enough to transform into some other dish. Just reheat the stuffing in the microwave, form it into balls (I used a small ice cream scoop), and float them in the golden soup. 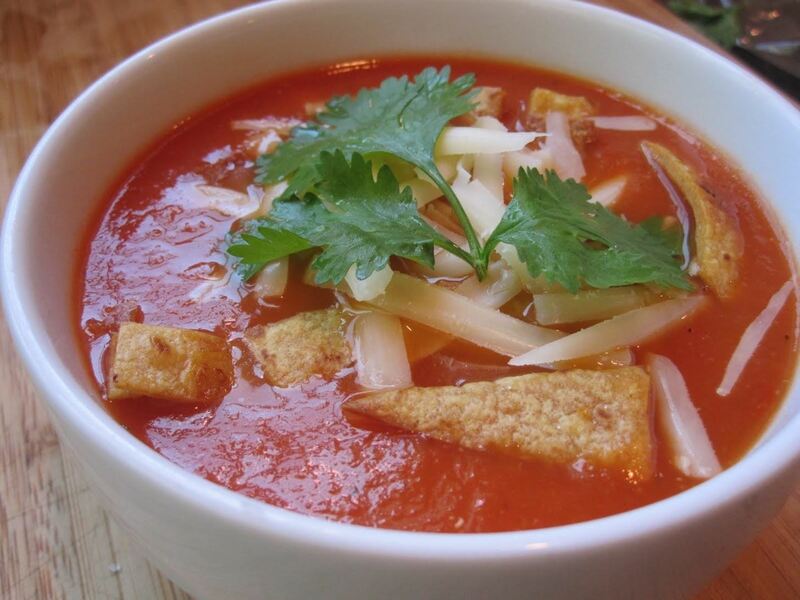 Cream of tomato isn't the only tomato soup in town; this Mexican version from Ellie Krieger is light, tangy, and loaded with spice. If you top it with crumbled tortilla chips, rather than the corn strips recommended in the recipe, you don't have to dirty a pan to fry or bake the tortilla. This vegetarian salad is full of crunch and protein. If you leave out the feta cheese, you can make it vegan while still getting plenty of protein from the garbanzo beans. (You can also substitute feta cheese with tofu that is prepared like feta.) To save a step, you can buy pita chips rather than making your own. 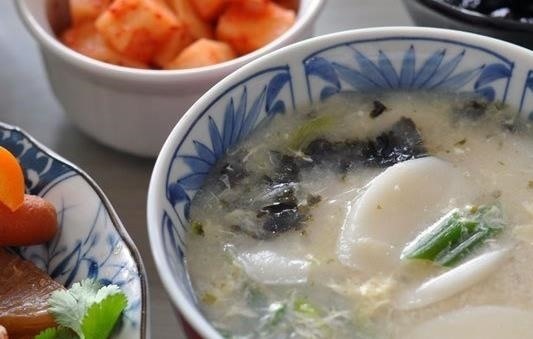 Yet another vegetarian delight, this soup is traditionally served in Korean homes as a way to start off the new year with good luck. The rice cakes, or dduk, can be found at Korean specialty markets. If your grocery store carries rice crackers, you can just pop those in instead. Just don't simmer them for the recommended 20 minutes or they might dissolve altogether; top the soup with them instead right before serving. Use ¼ cup shredded (not grated) cheese; for this salad, I used Parmesan. Heat a small frying pan on medium-high heat. When the pan is hot, drop the spoonful of cheese in. Flatten it out with a flexible spatula, then flip when you see the edges begin to brown (the amount of time will depend on they type of cheese; Parmesan takes about 2 minutes per side). Brown the other side, then remove the frico from the pan and allow it to cool fully before placing it atop your salad (it will wilt your lettuce if you plate it while hot). Kale and a dairy-free, cashew-based dressing bring a novel twist to this vegan, gluten-free version of the classic salad. 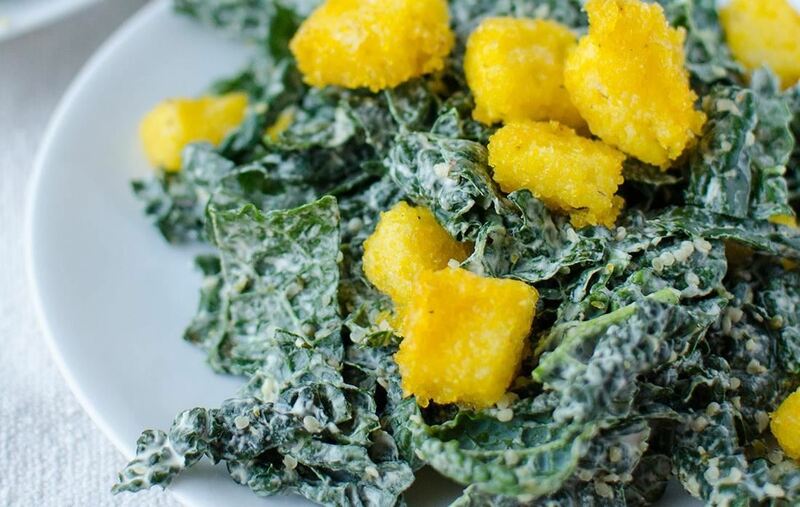 Polenta croutons add even more novelty, courtesy of dietician Alexandra Caspero in her Delish Knowledge food blog. Yeah, pumpkin soup is already on the list... but it's fall, and one can never have enough pumpkin when celebrating the spirit of the season. This particular recipe for super easy soup involves a kick of cumin and is topped with crunchy popcorn. (If you want to buy bagged popcorn, go for it. You know we're all about making life a little more lazy this season.) 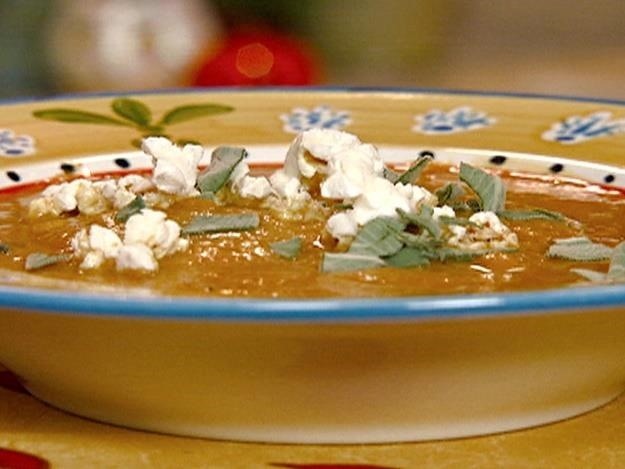 To mix sweet and savory, try topping the soup with kettle corn instead. Whether it's a stomach-warming soup or a crunchy, healthy salad (or both), you can turn your dinner-in-a-bowl into a novel meal with these unique crouton swaps. Add your suggestions and pairings in the comments! Don't Throw Away Stale Bagels—Turn Them into Croutons!